The road to the village Bakufa. 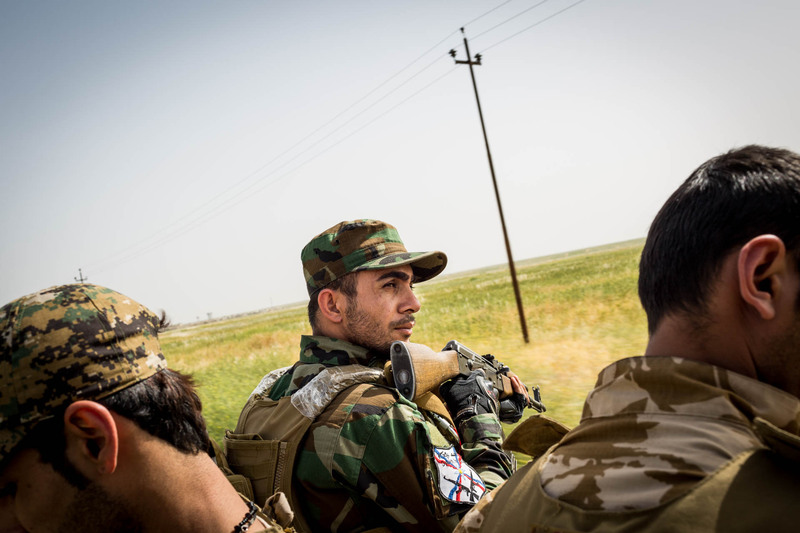 The last checkpoint on this road is in control of the Peshmerga, and the Dwekh Nawsha calls them their allies. Two members of the Dwekh Nawsha in their headquarters in Bakufa. From here, Mosul is roughly 35 km away. 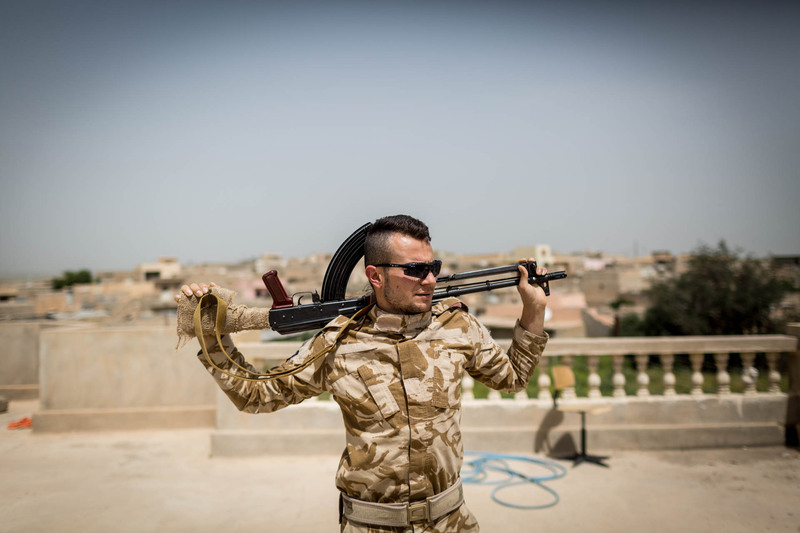 A member of the Dwekh Nawsha stands guard on a house in Bakufa. The next village down the road, Batnay, is in control of the Islamic State. 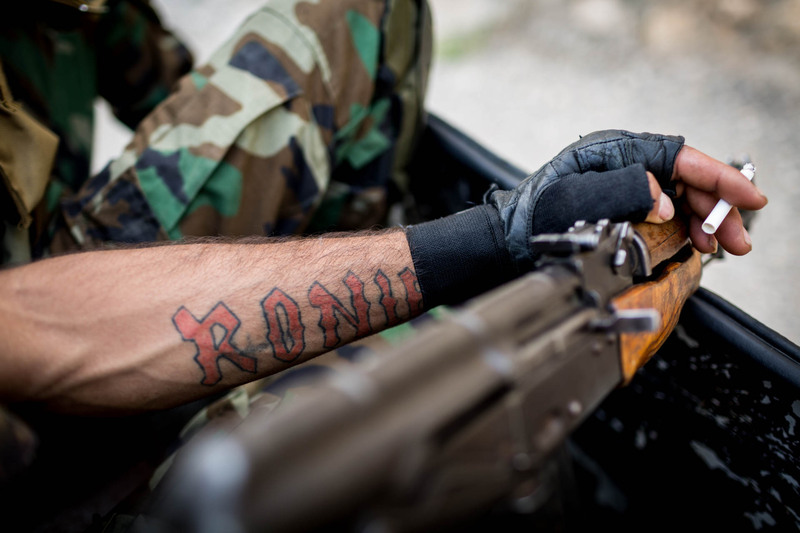 Sargon, a 27-year old member of the militia, joined the group after it was formed in summer 2014. 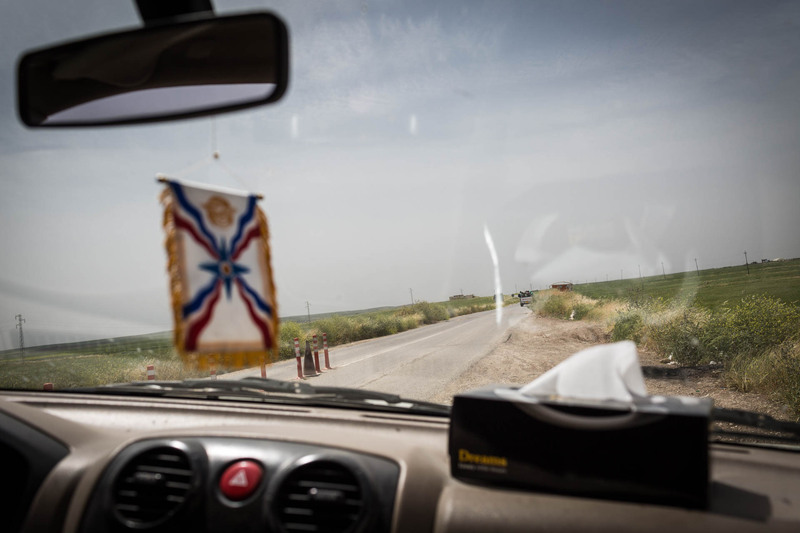 The Assyrian group mainly wants to secure the Assyrian villages around Mosul. The whole militia consists of volunteers. They left their lives as civilians behind and spent money on equipment and arms to join the group. Ronie, a member of the group, shows one of his tattoos. When the war is over, he wants to be an actor. 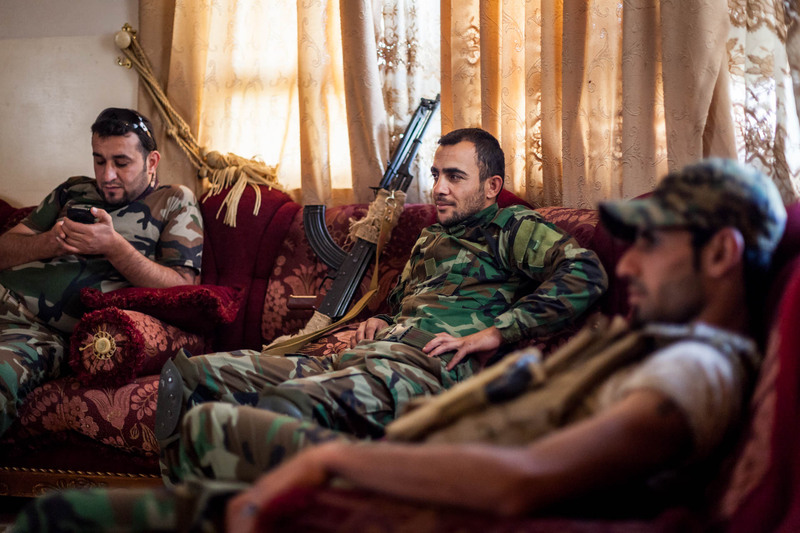 Three fighters of the Dwekh Nawsha in the living room of their headquarter in Bakufa. For most of the time, the Islamic State does not attact, but sometimes they shoot mortars or use the morning fog to attempt an advance. 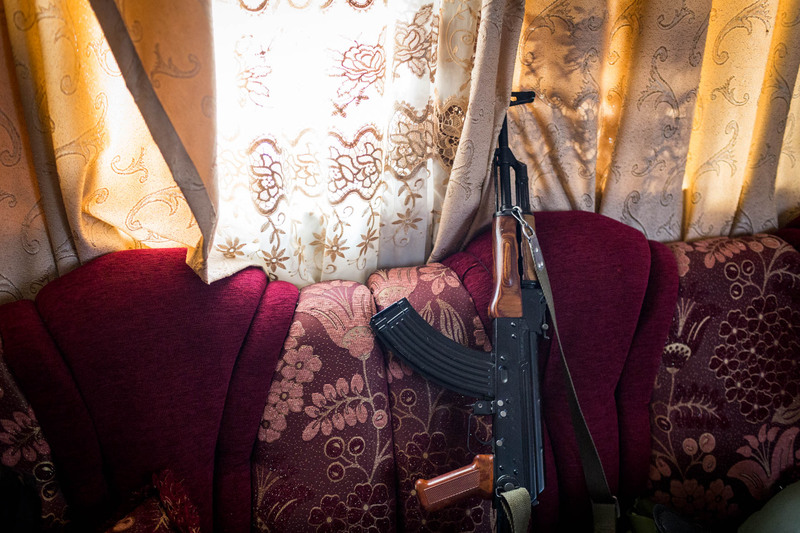 A rifle leans on a sofa in the living room. The group is generally pretty well equipped, except for ammunition. 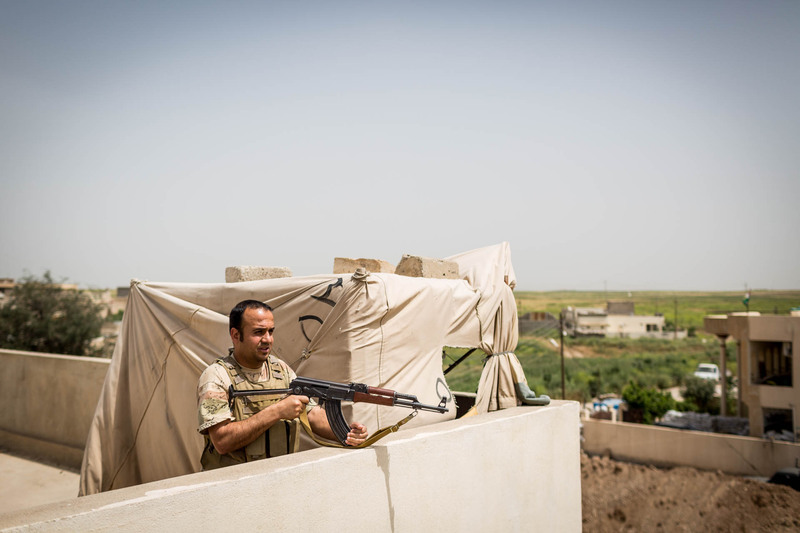 Irregularly, they are joined by foreigners from the US, France or the UK, that see it as their religious duty to defend Christianity in the area. A tattoo can be seen on the left arm of Ronie. 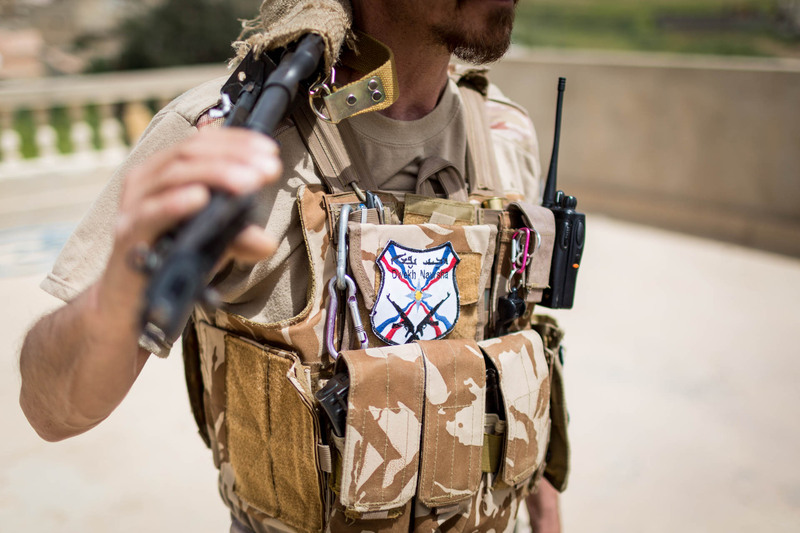 A fighter of the Dwekh Nawsha stands in the doorway of one of their pick-up trucks before going on patrol. The trucks have been modified to serve as technicals, mounted with a heavy machine gun. 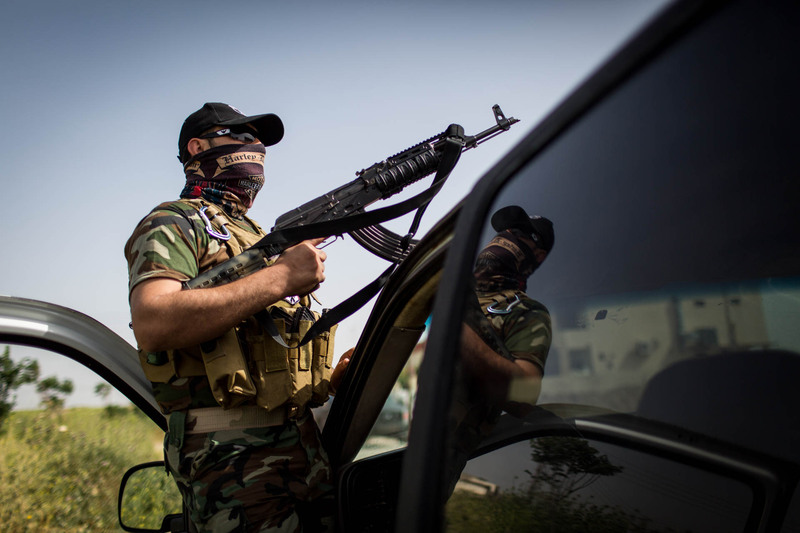 On their way to Alqosh, a fighter covers the left side of the pickup. 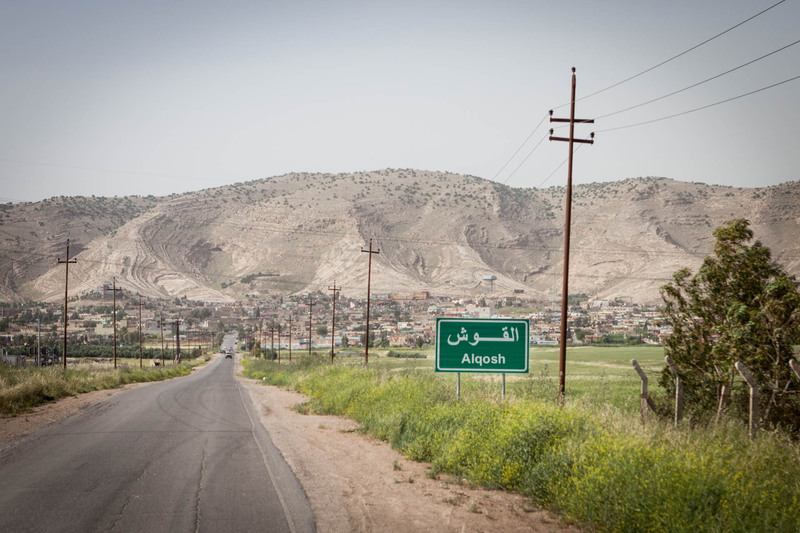 The city of Alqosh lies 40 km away from Mosul, its inhabitants are solely Aramaic speaking Christians. 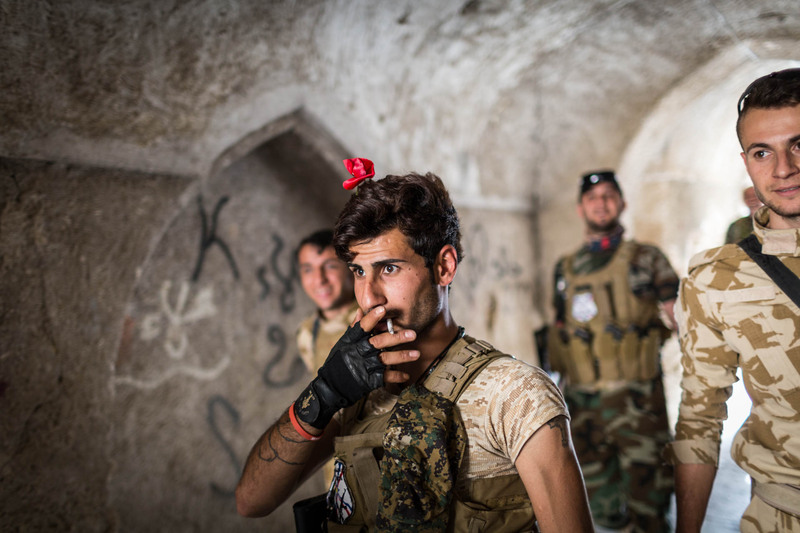 Most of them left the city, when the Islamic State was about to capture the road. Few of the citizens have returned until today, with the front line still being rather close. A fighter of the Dwekh Nawsha starts to pray inside a Jewish site that contains the remains of prophet Nahum, a prophet mentioned in both Bible and Torah. The tomb of Nahum lies in Alqosh and is in an appalling condition today. 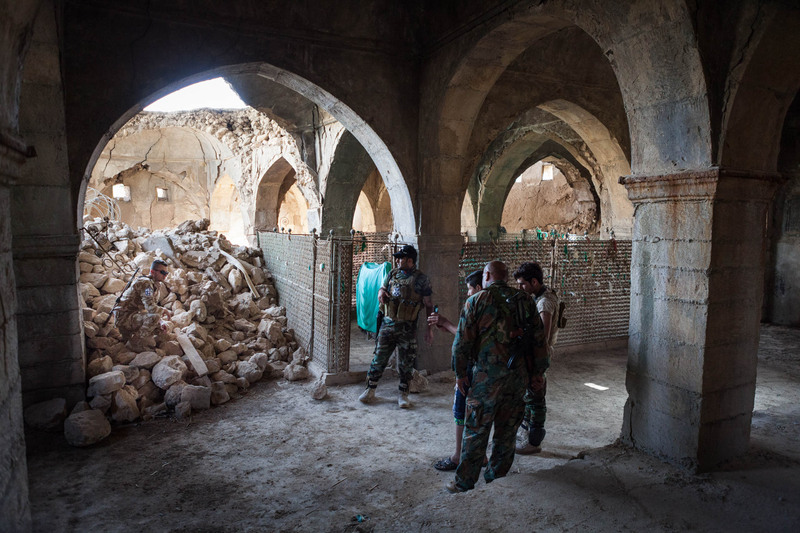 The building is one of very few synagogues in Iraq still visible. Sargon takes a photo with himself sitting on the remains of the partly collapsed roof. Because most of the groups fighters are not even 30 years old, they are always in the mood for jokes and nonsense. Ronie attached a red flower to his hair. 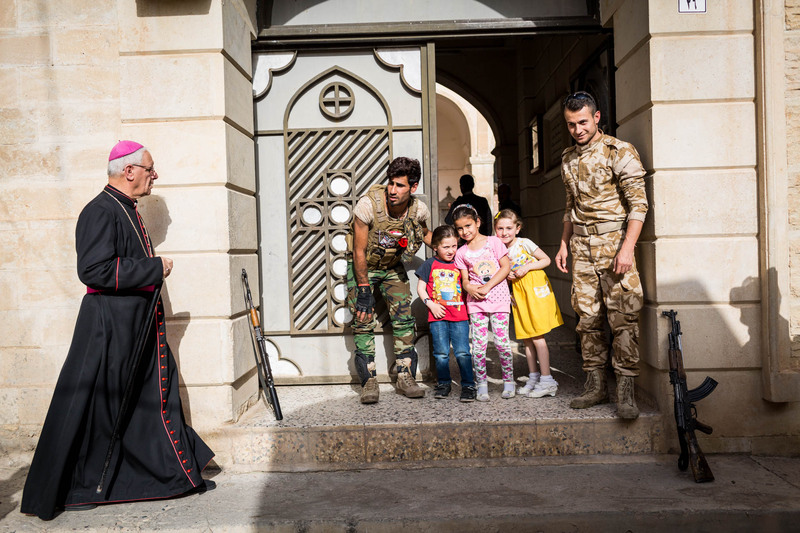 As Ronie and Sargon pose for a picture with a few local kids at the entrance of a church, a priest approaches. Alqosh has a very active religious community and its people have always been proud of their heritage. 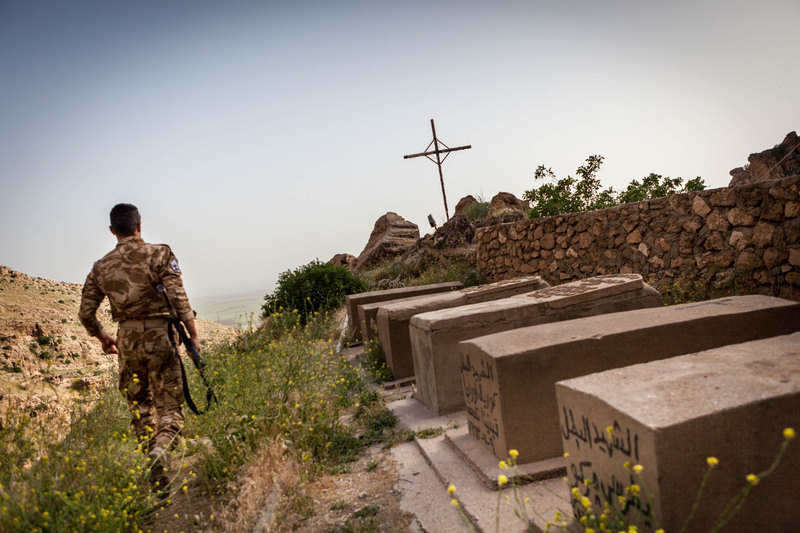 Sargon walks by graves that are situated in the compound of Rabban Hermizd monastery in the mountains behind Alqosh. 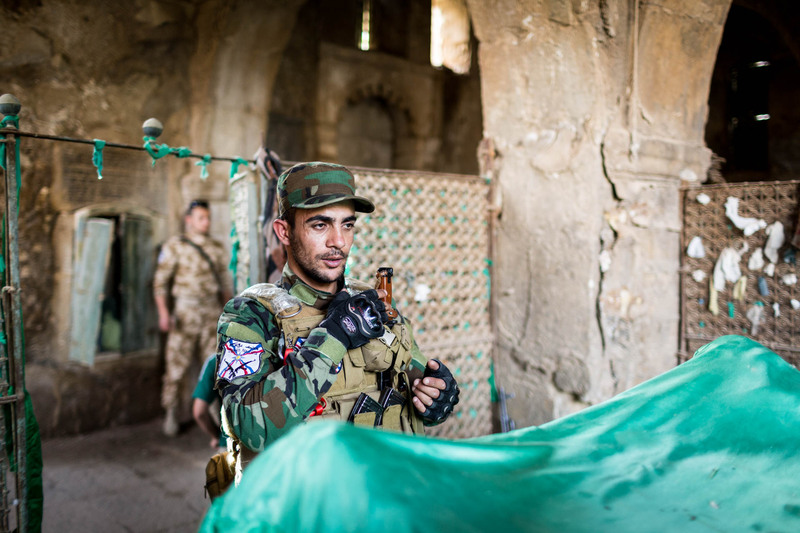 Today, both Peshmerga and the Dwekh Nawsha are responsible for the security of the monastery. 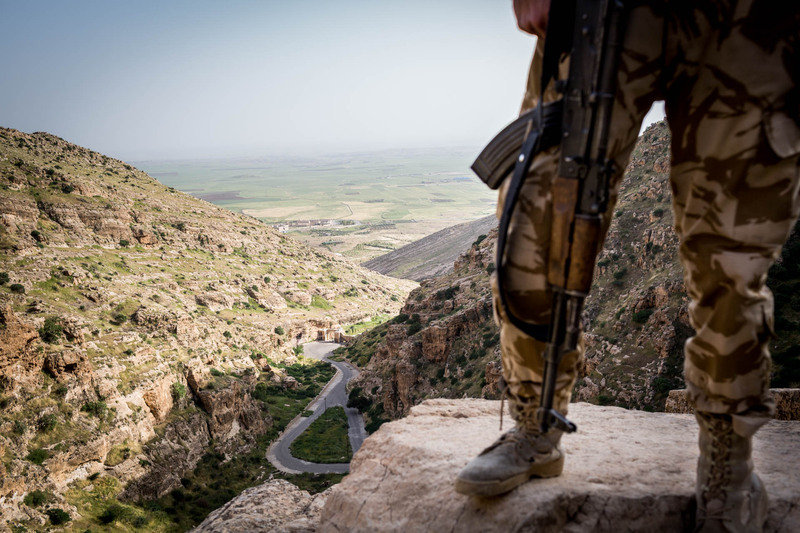 With a fighter standing on the cliff, the valley behind Alqosh can be seen. Mosul lies only about 40 km in this direction. 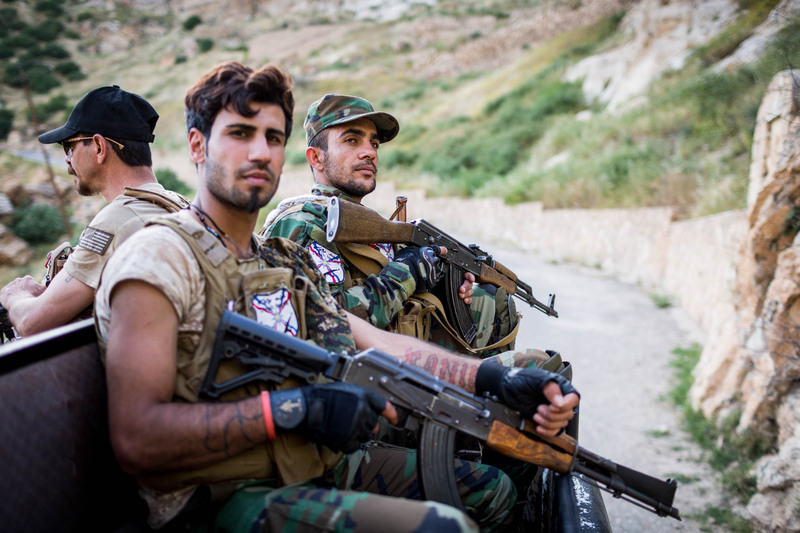 Three members of the Dwekh Nawsha are sitting on the back of their pickup, while returning to their base in Bakufa. 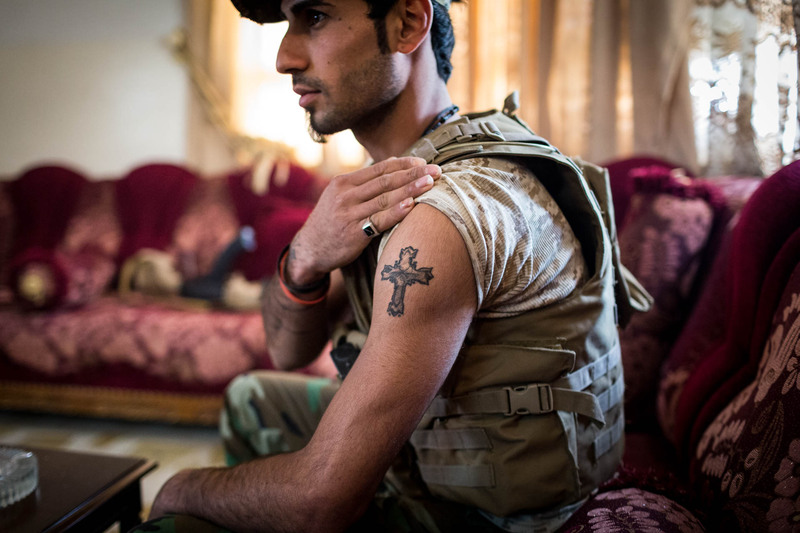 The Dwekh Nawsha (literally “one who sacrifices”) is a military organization created in June 2014 in order to defend Iraq’s Assyrian Christians from the Islamic State (IS), and possibly retake their lands currently controlled by the IS. 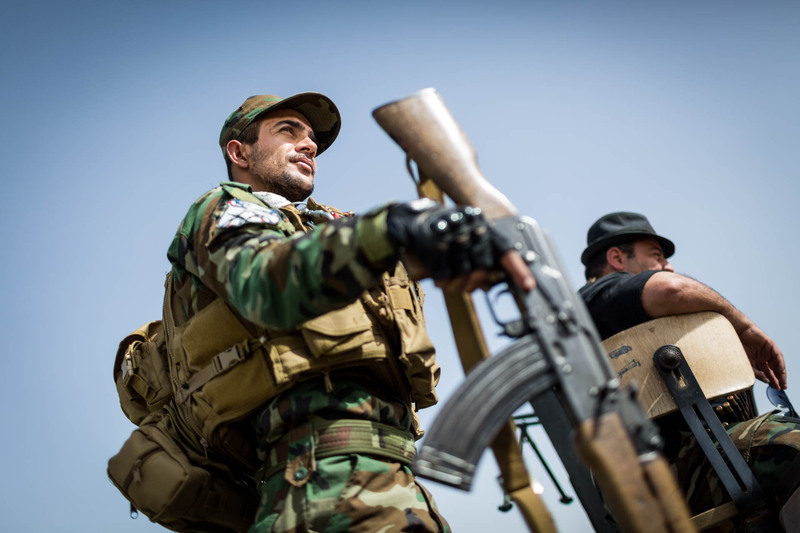 The Dwekh Nawsha operates in coordination with the regional and international security forces, such as the Kurdish Peshmerga. Today, the group consists of about 50 to 100 fighters. 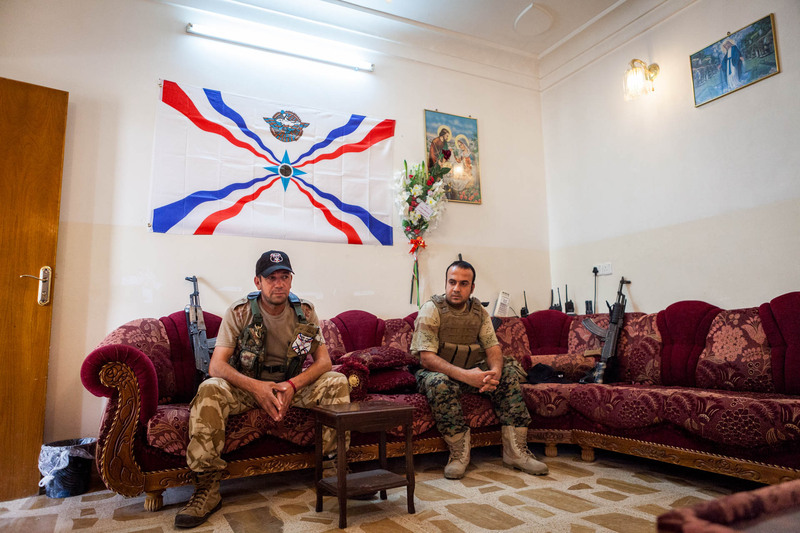 Despite being led by the Assyrian Patriotic Party, most fighters are not members of the party. Several foreign fighters have joined the Dwekh Nawsha; they include Americans, British, French and Australians.